Leaving Gailey Wharf, (look out for the large round toll keepers watch tower), you will be heading towards The Fox and Anchor Public House, where you can moor for the night, and which can be found ⅔ of the way between Hatherton Junction and Coven Heath Bridge No. 69. The canal is very winding, and curves in a wide arc to the left, towards the Hatherton Branch, over an aqueduct, then curves back to the right. The twists and turns continue more or less until you reach the point where the M54 crosses the canal. Just prior to here is the pub, but to minimise noise from the motorway, it would be advisable to moor nearer to Bridge No. 71, Cross Green Bridge, and walk the short distance to the pub. A nice meal and refreshing drink will probably be welcome now, ready for an early start tomorrow morning. You have cruised 4 miles in around 2 hours. 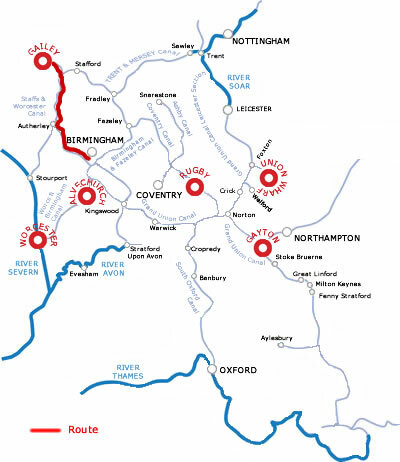 The canal is reasonably straight until you reach Autherley Junction, where the Shropshire Union Canal joins the Staffordshire and Worcester Canal. When the canal parts again, branch left onto the Birmingham Navigation at Aldersley Junction, where you will soon be met by the sight of the Wolverhampton 21 Locks, where you will have climbed 132 feet by the time you reach Wolverhampton Top Lock No. 1. A daunting prospect! If you want to moor up after these locks, you can take a look around Wolverhampton, and perhaps find a nice pub for a much-deserved drink and meal. There are many pubs and restaurants to choose from, offering a wide selection of meals. There are moorings before and after Broad Street Bridge. 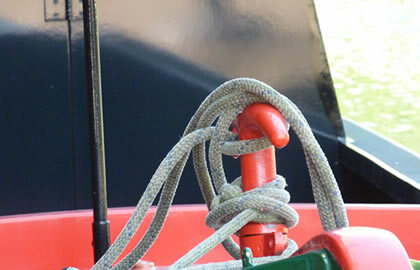 It is 5 hours to here but you have only travelled 5 miles,so perhaps move on for your night time mooring. Leaving here, stay on the main line canal, which twists and turns as it wends its way through places such as Ladymoor, and Coseley, where there is a tunnel that is 360 yards long. Once through the tunnel, carry on to Tipton Factory Junction, and turn right, onto the Wolverhampton Level , and moor along here and before Tipton Green bridge. It is 7.25 hours to here. You must eat at Mad O'Rourkes World famous Pie factory in Tipton where the pies are huge and legendary. Its in Hurst lane close to the Canal. The sense of history on the Birmingham Canal Old Main Line is almost overpowering. Its meandering course was partly replaced by Thomas Telford’s arrow-straight New Main Line, leaving peaceful looping backwaters, like manmade oxbow lakes. At Tipton Junction turn left straight on is the Black Country Museum , but takes a whole day to give it justice. You will be heading into the suburbs of Birmingham, past Brades Hall Junction, and Oldbury Junction to Spon Junction where you cross the Birmingham Main Line on an aqueduct through the 3 Smethwick Locks to Smethwick Junction where you join the Birmingham Main Line. Moor at the Sheepcote Street Visitor Moorings or close by, just before Deep Cuttings Junction. You are in the heart of Birmingham with Cambrian Wharrf , Brindley Place and the Gas Street Basin close by. You can see what this wonderful city has to offer. Gas Street Basin has been redeveloped into a unique experience, where traditional narrow boats can moor up alongside cosmopolitan cafe's and bars and you can enjoy a variety of entertainment, arts and shopping opportunities, all within a short walk. If you choose to moor up next to the Sea Life Centre, you will be spoilt for choice with the variety of cuisine on offer, with over 500 restaurants to choose from offering Caribbean to Nepalese, Thai to Italian, and many more. You will also find clubs and bars, cinema's, theatre's and comedy clubs. Among other attractions are the National Sea Life Centre, Fine Art Galleries, and the Jewellery Quarter, which dates back over 250 years and is still home to over 400 jewellery businesses. For those who like a little retail therapy, a visit to the Bullring is a must. It covers an area the size of 26 football pitches, and has an enormous range of shops. Also nearby, is the National Indoor Arena, one of the busiest large scale indoor sporting and entertainment venues in Europe. Turn your boat and start your journey home. It is 12.5 hours back to Gailey marina so turn your boat at Deep Cuttings Junction and head back the way you came. You will need to cruise for about 4 hours on day 3 on the way back, to leave enough time to get back on the last days. When you cruise back, take the Birmingham Main Line , so keep straight on at Smethwick Junction and cruise to Factory Junction,and continue as before.